Information on the purchasing power of the minimum wage over time, however, paints an incomplete picture. As a benchmark for workers’ living standards, the inflation-adjusted value of the minimum wage falls short because it assumes that minimum-wage workers should not expect their standard of living to improve relative to the standard achieved by workers 50 years ago, despite a doubling in the average worker’s productivity over the same period.2 More importantly for purposes of this report, the real value of the minimum wage tells us little about what the economy can realistically afford to pay low-wage workers at any given point in time. This report reviews a much wider range of benchmarks in order to evaluate how high the federal minimum wage can go and still fall within our historical experience. An extensive body of research since the early 1990s has investigated the employment impacts of federal, state, and local minimum wages in a range that falls roughly between $6 and $10 per hour. That research suggests that minimum wages in this range have little or no negative effect on employment.3 Recent proposals to raise the federal minimum wage, such as the Harkin–Miller proposal to target $10.10 by 2016, represent a continuation of the legislative advances of the last 20 years. But recent local, state, and federal minimum-wage legislation and proposals have enacted or considered wage floors above the $6–$10 range. 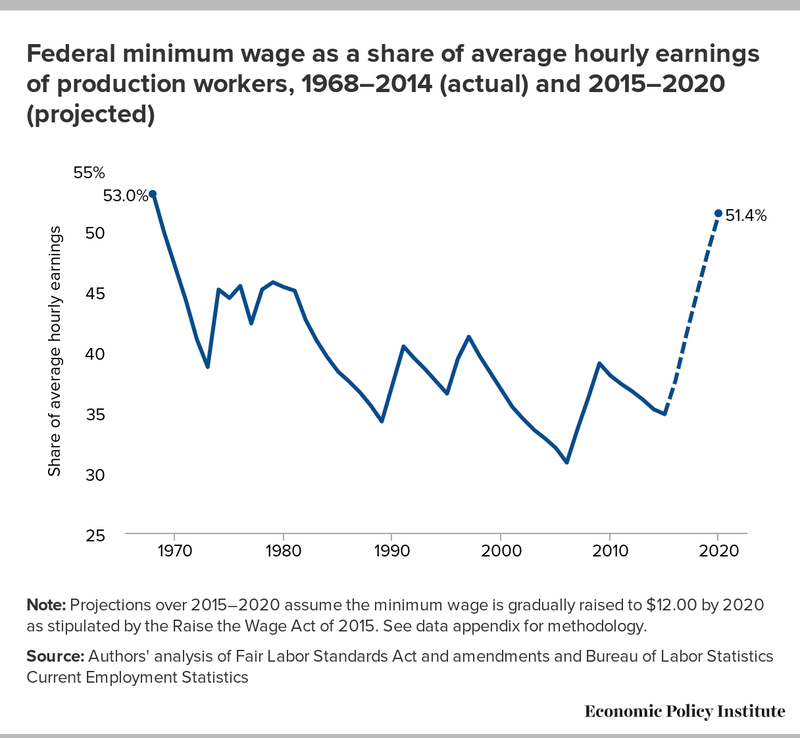 Proposals such as these—which achieve higher targets by phasing-in minimum-wage increases over a longer period of time—are required to ensure the minimum wage is as adequate a wage floor as it was in the late 1960s. In effect, the real value of the minimum wage fell to such an extent in the 1980s (a period of relatively high inflation) that proposals more aggressive than those of the last two decades are needed. This is the motivation for the Raise the Wage Act, the proposal put forward by Sen. Patty Murray (D-Wash.) and Rep. Bobby Scott (D-Va.) to target a $12.00 minimum wage in 2020. This report’s basic approach is to take the wage distribution from 1968—the year the minimum wage reached its high-water mark, and when the national unemployment rate was 3.6 percent4—as a guide to what the economy can afford to pay the lowest-wage workers. We compare features of the 1968 wage distribution with the current U.S. wage distribution and with our projections of the wage distribution in 2020. We focus our analysis on the proposal to gradually increase the federal minimum wage to $12.00 per hour by 2020. A federal minimum wage of $12.00 in 2020 would return the wage floor to about the same position in the overall wage distribution that it had in 1968. In 1968, the minimum wage stood at 52.1 percent of the median wage.5 By 2014, this ratio had fallen to 37.1 percent. Raising the federal minimum wage to $12.00 by 2020, under the conservative assumption of no real wage growth at the median, would leave the ratio at 54.1 percent, just above where it was in 1968. If we assume just 0.5 percent annual real wage growth for the median worker between now and 2020, the ratio would fall to 49.9 percent. A broadly similar story emerges when using the average hourly earnings of nonsupervisory production workers, instead of the median wage, as a benchmark. The federal minimum wage was equal to 53.0 percent of the average production worker wage in 1968. By 2014, this ratio had fallen to 35.2 percent. Raising the federal minimum wage to $12.00 by 2020 would restore the ratio to 51.4 percent (under the conservative assumption of no real wage growth for production workers), just below its 1968 value. The strong rise in average worker productivity and the increase in the age and educational attainment of low-wage workers in the last five decades suggest that the 1968 benchmark may understate the economy’s capacity to support a higher national wage floor in 2020. 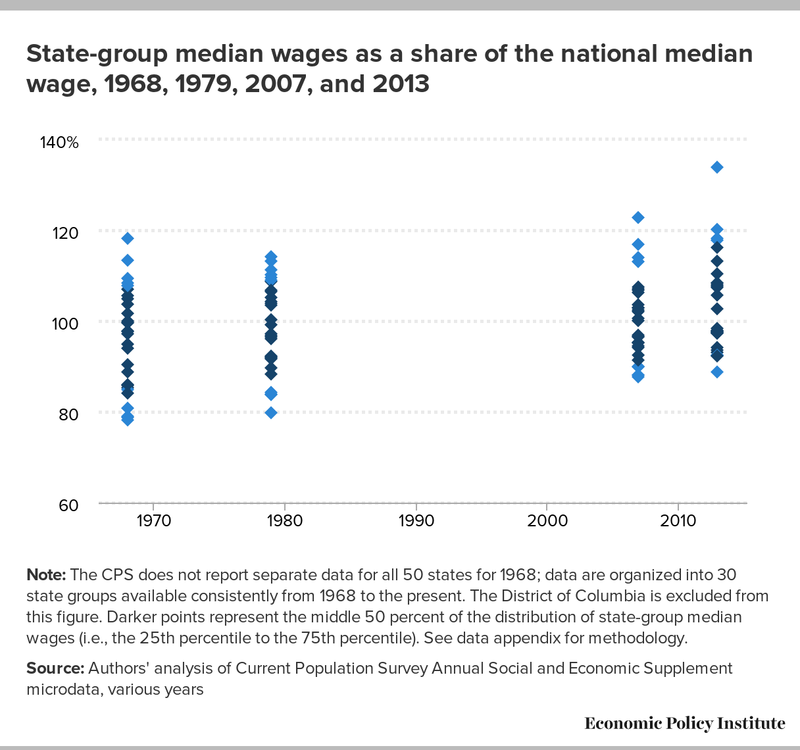 The compression of median wages across the U.S. states over the last five decades, especially the catching up of lower-wage states, means that the federal minimum wage has less impact on low-wage states today than was the case in 1968. In what follows, we first present data on the federal minimum wage and the national wage distribution from 1968 through 2014, including projections through 2020. We place special emphasis on the ratio of the minimum wage to the national median wage, which economists often refer to as the Kaitz index.6 We then document the substantial compression since 1968 in median wages across the U.S. states. Note: See data appendix for methodology. We present two types of benchmarks. In this section, we describe the benchmarks in some detail; in the next section we apply the available data to the benchmarks and review long-term trends. Standard-of-living measures speak only indirectly to the economy’s capacity to support a given minimum-wage level. The second set of benchmarks in Table 1, therefore, focuses on the overall wage distribution, which arguably is a more relevant benchmark for any assessment of the economy’s ability to sustain a particular wage floor. A final wage-distribution-related benchmark is the share of workers who earn at or below the federal minimum wage. The ratio of the minimum wage to the median wage, while useful, does not, on its own, provide a complete description of the wage distribution below the median. The percentile point where the minimum wage cuts in the overall wage distribution gives additional information on the likely “bite” of an existing or proposed minimum-wage level. With respect to the wage-distribution-related measures, the 2014 minimum wage was equal to only 37.1 percent of the hourly median wage of full-time, full-year workers, well below the 52.1 percent level in 1968 (row five). A similar pattern holds for the current minimum wage relative to the average hourly earnings of production and nonsupervisory workers: In 2014 the minimum wage stood at 35.2 percent of the average production worker wage, down from 53.0 percent in 1968 (row six). There does not exist comparable data that would allow us to reliably measure the share of the workforce earning at or below the minimum wage in 1968, but that share was almost certainly well above the 4 percent of workers in that wage range in 2014 (row seven). Recent efforts to increase the minimum wage, such as the Harkin–Miller proposal, have typically taken a relatively cautious approach, proposing increases that leave any new wage floor well within the range of recent historical levels. Minimum wages in these ranges have been well-studied at the federal, state, and local levels, with an emerging consensus (Doucouliagos and Stanley 2009; Schmitt 2013a; Belman and Wolfson 2014) that any negative effects on employment are near zero or small relative both to the number of workers benefiting from the policy and the size of the wage gains (Congressional Budget Office 2014).14 However, a proposal to increase the federal minimum wage to $12.00 would, by most measures, take the minimum wage outside the range it has been within since the early 1990s. 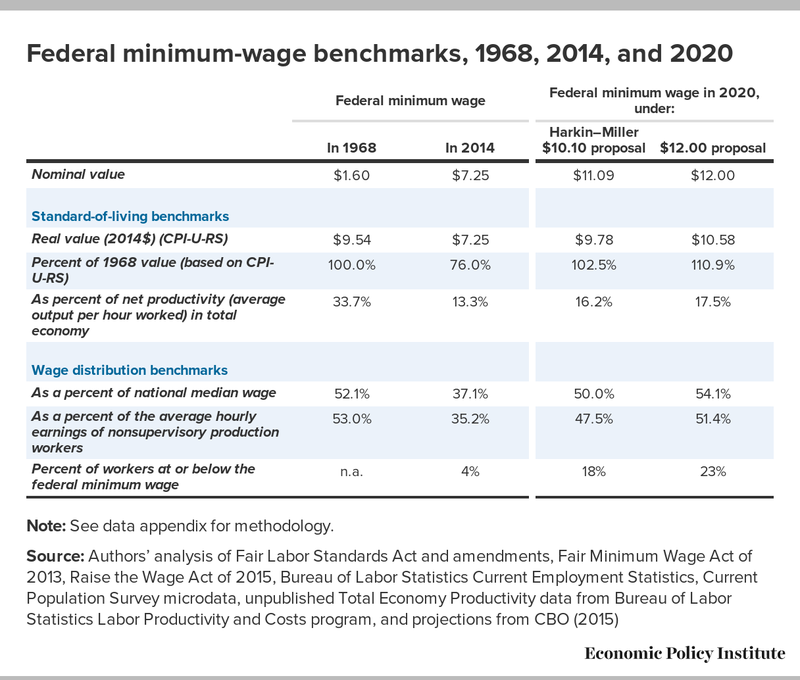 The last two columns of Table 1 apply the same benchmarking exercise to the two proposals for raising the federal minimum wage. The $10.10 proposal falls short of the 1968 standard by some measures, while the $12.00 proposal roughly restores the minimum wage to the level reached in 1968. For simplicity, the calculations in the table assume that the 2020 wage distribution is identical, in inflation-adjusted terms, to the 2014 wage distribution. This assumption affects our analysis in two ways. First, because we do not allow for any real wage growth over the period, we likely overstate the “bite” of the minimum wage in 2020. If the inflation-adjusted median wage grows between now and 2020, as is reasonably likely, then the ratio of the minimum wage to the projected median will be lower than what we are projecting. Second, because we assume no change in wage inequality between now and 2020, we effectively ignore any impact of the phase-in of the minimum-wage increases on the overall wage distribution through 2020 (as well as any other factors that might affect inequality over the next five years). The $10.10 proposal—which would produce a minimum wage of $11.09 per hour in 2020 (equal to $9.78 in 2014 dollars)—would roughly match the 1968 minimum wage in terms of purchasing power (102.5 percent of the 1968 value). That is a low bar, however, because it implies that low-wage workers would earn in 2020 only what their counterparts earned more than 50 years earlier. A $10.10 target also falls short of the 1968 levels on all the other measures in Table 1. The $10.10 proposal would put the 2020 minimum wage at only 16.2 percent of the average level of net productivity in the same year. With respect to the wage-distribution indicators, the federal minimum wage would rise to only 50.0 percent of the national median wage, compared with 52.1 percent in 1968, and to only 47.5 percent of the average production worker wage, compared with 53.0 percent in 1968. The $12.00 proposal would roughly restore the 1968 value of the minimum wage, according to most of our benchmarks. A wage floor of $12.00 in 2020 would be 10.9 percent above the inflation-adjusted value of the 1968 minimum wage, but would fall far short of what the minimum wage would have been if it had kept pace with productivity growth since 1968. At $12.00 in 2020, the minimum wage would be equal to 17.5 percent of average net productivity per hour, down from 33.7 percent in 1968. 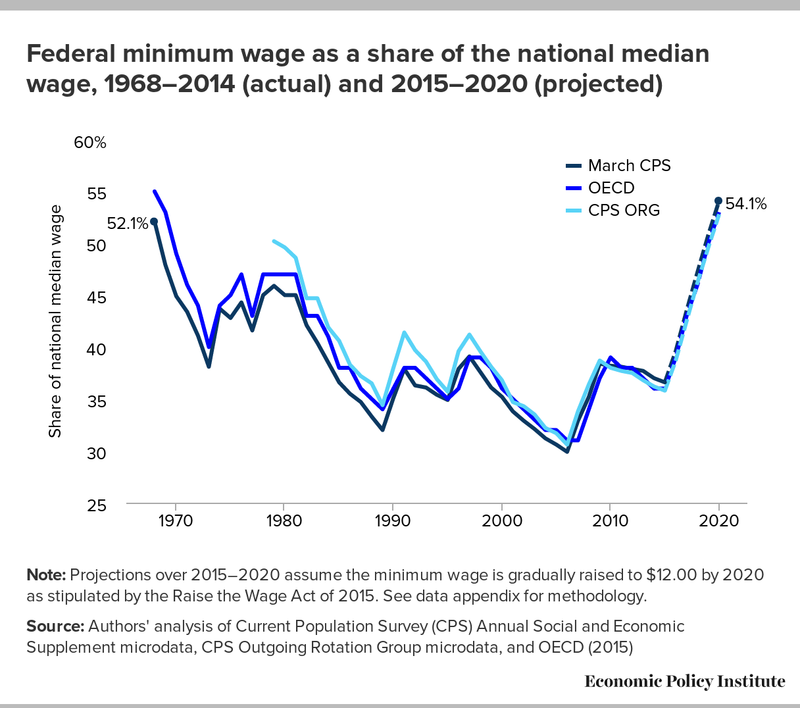 Figure A1 summarizes the relationship between the federal minimum and the national median wage from 1968 through 2014, using data from three different sources: for 1968 to the present, our analysis of the March CPS data for full-time, full-year workers, and the OECD’s independent analysis of the March CPS data; and for 1979 to the present, our analysis of the CPS Outgoing Rotation Group (ORG), which uses a completely different wage concept than the March CPS. We have also projected the relationship between the minimum and the median through 2020, assuming the implementation of the $12.00 proposal (and no real wage growth and no change in inequality through 2020). Note: Projections over 2015–2020 assume the minimum wage is gradually raised to $12.00 by 2020 as stipulated by the Raise the Wage Act of 2015. See data appendix for methodology. For the years where the data overlap, the series track each other closely, which gives us some confidence about our use of the March CPS data series back to 1968, when the CPS ORG data, which we generally prefer, are not available.16 For our purposes, the key feature of Figure A1 is that the two series that cover the full period from 1968 to 2014 and include projections through 2020 both show that the $12.00 per hour proposal would bring the relationship between the minimum wage and the median wage back to where it was in 1968. Figure A2 presents a similar analysis for the relationship between the federal minimum wage and the average hourly earnings of production and nonsupervisory workers, our other benchmark wage. The ratio of the minimum wage to the average production worker wage closely mirrors the pattern seen in Figure A1 using the median hourly wage from the March CPS. The ratio declines with ups and downs from the late 1960s through the mid-2000s before recovering some of its lost value after the 2007–2009 increases. Our conservative projections of wage growth suggest that increasing the federal minimum wage to $12.00 by 2020 would almost completely restore the relationship between the federal minimum and the average production worker wage that prevailed in 1968. The current federal minimum lies well below all the 1968 benchmarks, including those based on standard of living and those based on the relationship to the broader wage distribution. The recent proposal to increase the minimum wage to $10.10 by 2016 and index it to inflation thereafter would be a noticeable improvement, recovering the purchasing power from five decades earlier, but leaving minimum-wage workers well below benchmarks based on productivity, and slightly below benchmarks based on the overall wage distribution. The $12.00 proposal would raise the purchasing power of the minimum wage modestly relative to 1968 (up about 11 percent) and roughly restore the relationship between the minimum wage and the overall wage distribution in place in 1968. But, even at $12.00 in 2020, the minimum wage would fail, by a large distance, to reconnect the minimum wage to average productivity growth since 1968. Even if the economy can afford a minimum wage of $12.00, employers may need time to adjust to the higher wage floor. 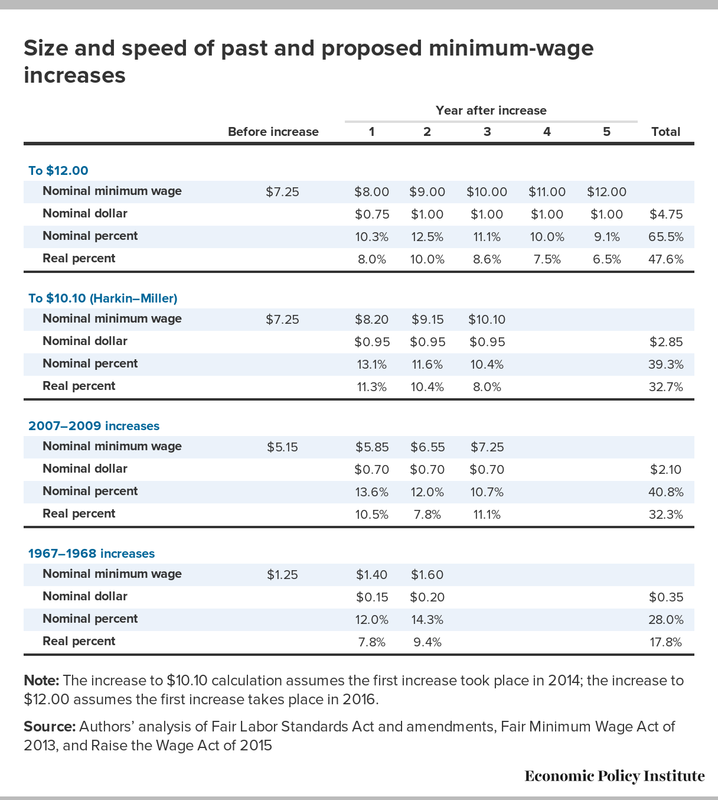 Table 2 summarizes data on the size and speed of the 1967–1968 and 2007–2009 increases in the minimum wage, together with corresponding projections for the $10.10 and $12.00 proposals. For each set of increases, the table shows the nominal value of the minimum wage in each year leading up to the full increase; the nominal increase in dollars and cents; the nominal increase in percent terms; and the inflation-adjusted increase in percent terms. Where possible, the total increases are allocated across the phase-in periods, which range from two years in 1967–1968 to five years in the case of the proposed $12.00 increase. Note: The increase to $10.10 calculation assumes the first increase took place in 2014; the increase to $12.00 assumes the first increase takes place in 2016. 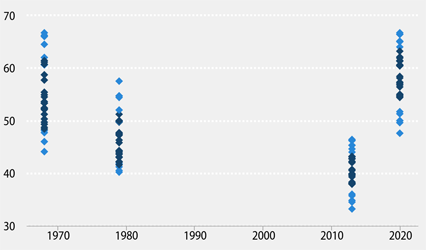 The total nominal and real increases implied in the $12.00 proposal are larger than the 1967–1968 and 2007–2009 increases (as well as the $10.10 proposal). But this is primarily because the yearly increases in the $12.00 proposal, which are in both real and nominal terms similar to the earlier increases, are sustained for five years instead of two (1967–1968) or three (2007–2009) years. In short, the $12.00 proposal raises wages at a similar rate as past increases, but does so for a longer period of time. The preceding discussion of benchmarks suggests that a $12.00 minimum wage in 2020 would raise minimum-wage workers’ earnings modestly relative to 1968, while keeping the relationship between the minimum wage and the wage distribution within the range in place in that year (when the national unemployment rate was below 4 percent). For several reasons, however, these calculations likely understate the economy’s capacity to support raising the minimum wage to $12.00. First, the average worker is about twice as productive today as in 1968. In general, across countries and over time within the same country, we expect wages to move in line with average productivity. This is why barbers (whose productivity, measured as haircuts per hour, has not changed much in a century) don’t earn in inflation-adjusted terms only what their predecessors earned a century ago. This is also why workers at a microchip plant (whose productivity, measured as calculations-per-second-adjusted chips per hour, which is millions of times higher now than it was even a few decades ago) don’t make tens of thousands of dollars per hour. In the period from the end of World War II through the late 1970s, the wages of most workers in the U.S. economy did, in fact, closely track average productivity growth. Since the end of the 1970s, however, most wages have not kept pace with average productivity.17 If the national median wage had, instead, kept pace with productivity since the end of the 1970s, then a constant ratio of the minimum wage to the national median would have implied a substantially higher federal minimum. Second, low-wage workers are much better educated and older (and therefore more likely to have more work experience) today than their counterparts in the 1960s. In 1968, for example, among workers in the bottom fifth of the wage distribution, only 17 percent had some college education or more; by 2012, the share of the bottom fifth that had at least some college education had risen to 46 percent.18 To the extent that better-educated, more experienced workers typically earn more than less-educated, less-experienced workers, we would expect that low-wage workers would earn more, not less, than what they earned in 1968. In this section we emphasize an additional reason to believe that we have more room to maneuver on the minimum wage than we did in 1968: The wage distributions across the U.S. states are closer together now than they were five decades ago. As a result, a federal minimum wage has a smaller “bite” today in low-wage states than was the case in 1968. This should help to allay concerns that a higher federal minimum wage would hurt employment in low-wage states. Apprehensions about raising the federal minimum wage are often motivated by the potential impact on low-wage states in the South. Figure B displays the median hourly wage in the nine Census divisions, in 1968, 1979, 2007, and 2013. Of particular interest are the three Southern divisions (South Atlantic, East South Central, and West South Central), where state minimum-wage laws are rare and state median wages have historically been lower than in other parts of the country. 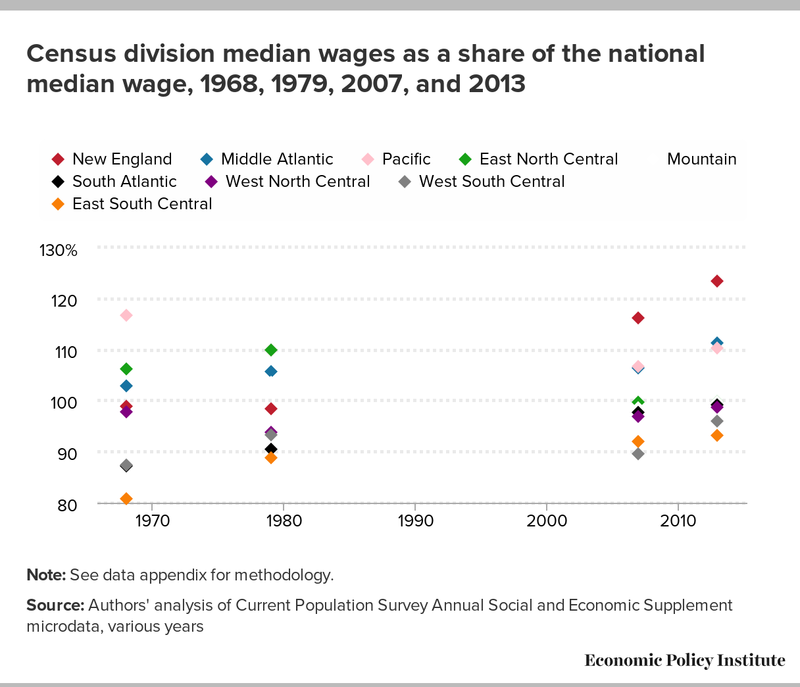 The data at the Census division level show a clear tendency toward compression between 1968 and 2013, with the ratio of the division median wage in these three divisions moving from a range of 81–87 percent of the national median wage in 1968 to a range of 93–99 percent of the national median in 2013. These data suggest that any given level of the federal minimum wage today will have less relative impact on southern states than was the case in 1968. Note: The CPS does not report separate data for all 50 states for 1968; data are organized into 30 state groups available consistently from 1968 to the present. The District of Columbia is excluded from this figure. Darker points represent the middle 50 percent of the distribution of state-group median wages (i.e., the 25th percentile to the 75th percentile). See data appendix for methodology. As Table 3 demonstrates, in 1968, three of the 30 state groups had a median more than 20 percent below the national median, and seven of the 30 had medians between 10 and 20 percent below the national median. By 2013, no state group was more than 20 percent below the national median, and only one state group (Oklahoma and Arkansas) was more than 10 percent below the national median. In that same year, two-thirds of the state groups (21) were within 10 percent of the national median, up from 18 in 1968—and eight were more than 10 percent above the national median, up from just two in 1968. Note: The Current Population Survey does not report separate data for all 50 states for 1968; data are organized into 30 state groups available consistently from 1968 to the present. Note: The CPS does not report separate data for all 50 states for 1968; data are organized into 30 state groups available consistently from 1968 to the present. Projections for 2020 assume a $12 minimum wage that year. Darker points represent the middle 50 percent of the distribution of state-group median wages (i.e., the 25th percentile to the 75th percentile). See data appendix for methodology. So far, we have focused exclusively on the federal minimum wage. 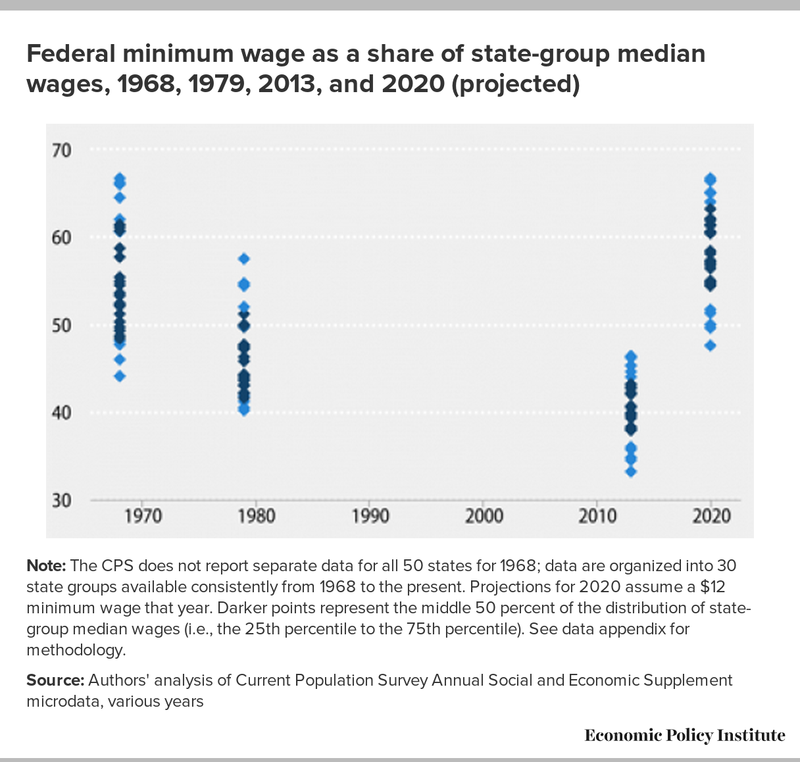 In order to see how the rise of state-level minimum wages, particularly since the early 1990s, might affect our conclusions, Figure E summarizes the distribution of the ratio of the binding state or federal minimum wage to the state median in each of the 50 states and the District of Columbia from 1979 through 2020, using the CPS Outgoing Rotation Group (ORG) for 1979 to 2014 and our projections through 2020.24 Using this alternative data source, using the full set of states, and incorporating state minimum wages that lie above the federal minimum wage do not affect our conclusions. The ratio of the applicable minimum wage to state median wages fell fairly consistently between 1979 and the mid-2000s, before rising somewhat after the 2007–2009 federal minimum-wage increases. Raising the federal minimum wage to $12.00 by 2020 would, by this measure, return the wage distribution to broadly where it was in 1979, presumably well below its 1968 level (if comparable hourly wage data were available before 1979). Note: Projections over 2015–2020 assume that there is no growth in real median wages, and that the minimum wage is raised to $12.00 in 2020 as stipulated in the Raise the Wage Act of 2015. See technical appendix for methodology. By every common benchmark, today’s federal minimum wage is far below its 1968 value. Raising the federal minimum to $12.00 by 2020 would raise the purchasing power of the minimum wage modestly relative to where it was five decades ago. It would also restore the relationship between the minimum wage and the wage of workers in the middle (whether measured using the median wage or the average wage of production workers). Several long-term developments in the U.S. economy suggest that returning to the level of the minimum wage reached in 1968 should be an easier lift for the economy now than it was then (when the national unemployment rate was below 4 percent). The average worker is more than twice as productive today as in 1968. The average low-wage worker now is also older and much better educated than was the case in 1968. And states in the South and elsewhere that paid much lower-than-national wages in 1968 have caught up to the rest of the country. This means that setting a new national minimum wage according to the 1968 ratio of the minimum wage to the median wage implies significantly less impact on today’s lower-wage states. The convergence of wages across the states over the last five decades makes returning to the 1968 norm in 2020 an achievable target well within our historical experience. — We thank Ben Zipperer for many helpful comments and for sharing data. All errors are our own. David Cooper is an economic analyst with the Economic Policy Institute. He conducts national and state-level research on a variety of issues, including the minimum wage, employment and unemployment, poverty, and wage and income trends. He also provides support to the Economic Analysis and Research Network (EARN) on data-related inquiries and quantitative analyses. David has been interviewed and cited by numerous local and national media for his research on the minimum wage, poverty, and U.S. economic trends. He holds a Master of Public Policy degree from Georgetown University. John Schmitt is senior economist at the Center for Economic and Policy Research and a research associate of the Economic Policy Institute. He has written for popular and academic publications on wage inequality, the minimum wage, education, job quality, unions, and comparative economic performance. He holds a Ph.D. in economics from the London School of Economics. The wage data in this paper come from two sources: the Outgoing Rotation Group of the Current Population Survey (CPS-ORG), and the Annual Social and Economic Supplement to the Current Population Survey (March CPS). Researchers generally agree that the best source of hourly wage data is the Current Population Survey’s Outgoing Rotation Group. The CPS is a nationally representative monthly survey conducted by the Census Bureau and the Bureau of Labor Statistics that tracks a variety of labor force, employment, and unemployment measures. Participants in the survey are interviewed monthly for four months, not interviewed for eight months, and then interviewed again for a final four months before they exit the survey. In the fourth and eighth months of survey participation, respondents are asked about their hourly and weekly wages in the week preceding the interview. The respondents in this group constitute the “outgoing rotation group.” Unfortunately, the ORG data, and the wage concept defined within the ORG questions, has only existed since 1979—making wage analyses prior to that time more difficult. For all survey years, we restrict the sample to respondents who are 16 years old or older with positive wage income, and who reported being employed and at work for at least 50 weeks in the preceding calendar year. We exclude respondents who report being self-employed in unincorporated businesses. From survey year 1976 forward, respondents report the number of hours they usually worked in the weeks they worked during the preceding calendar year. We restrict the sample to those reporting that they worked at least 35 hours per week, and calculate hourly wages as each respondent’s annual wage income divided by the weeks they worked, divided by their usual hours for those weeks. For survey years prior to 1976, respondents were not asked the usual number of hours they worked during their weeks of employment in the preceding year; rather, they were simply asked to indicate whether they were full time or part time. However, from the basic monthly CPS questions—i.e., not the March supplemental questions—we know the hours they worked in the week preceding the survey. Thus for these years, we restrict the sample to workers reporting that they were full time in the preceding year and who worked at least 35 hours in the week preceding the survey. Additionally, weeks worked in the preceding year are reported in bins, with the relevant bin having a value of “50 to 52 weeks.” Consistent with the Unicon Research Corporation’s standard recoding of the CPS data, these observations are assigned a discrete weeks value of 51.91 weeks. Hourly wages are then calculated as respondents’ annual wage income divided by the weeks they worked in the preceding year, divided by the hours they worked in the week before the survey. We also present published data from the Bureau of Labor Statistics on the average hourly earnings of production and nonsupervisory workers, as well as data on the ratio of the minimum wage to the median wage in the United States from the Organisation for Economic Co-operation and Development (OECD). The OECD publishes independent analyses of the ratio of countries’ minimum wages to median wages in their online statistical database (see OECD 2015). Both of these published data series are presented for external verification of our CPS-based wage series and of the relationship between the minimum wage and U.S. median (or average) wages over time. Throughout the paper, median wages are calculated from the CPS data using a technique to “smooth” hourly wages to account for “wage clumps” in the distribution, as described in Mishel et al. (2012), Appendix B. Prior to 1977, the March CPS data do not individually identify each state. For example, from 1968 to 1972, Maine, Massachusetts, New Hampshire, Rhode Island, and Vermont are grouped as one unit. Therefore, to preserve comparability from more recent periods to 1968, in Figure C and Figure D we present data on the medians for each state-group as they were defined in 1968. Throughout the paper, productivity is measured as total economy output per hour, net of depreciation, calculated from unpublished tables from the Bureau of Labor Statistics Labor Productivity and Costs program. We calculate the value of the minimum wage as a percent of net labor productivity in three ways. In Table 1, we report the ratio of the minimum wage to net labor productivity as the ratio of the real federal minimum wage deflated by the CPI-U-RS, to net output per hour deflated by the GDP deflator. In a related note in the text, we also report the same ratio using first the CPI-U-RS to deflate both the numerator and the denominator and then the GDP to deflate both terms. For all projections to 2020, we inflate the reported or calculated 2014 (or 2013, in the case of the March CPS data) values out to 2020 using the Congressional Budget Office’s projections for the Consumer Price Index for all urban consumers in CBO (2015). Except where explicitly stated, we assume no real wage growth at any point in the wage distribution—i.e., no growth in nominal wage values beyond the CBO’s inflation projections and no change in wage inequality over the period. Projections for productivity growth are also based upon CBO projections for potential labor force productivity in CBO (2015), Table 2-2. The percent of workers at or below the federal minimum wage in 2020 under the Harkin–Miller $10.10 proposal and $12.00 proposal in Table 1 account for increases to state minimum wages legislated as of January 1, 2015, and scheduled to occur by 2020, including increases due to inflation indexing. 1. We use the CPI-U-RS (chained to the CPI-X-11 before 1978), not the CPI-U, to calculate the real value of the minimum wage. Using the CPI-U, the real value of the 1968 minimum wage in 2014 would have been $10.88. 2. Average, economy-wide productivity—the real value of goods and services produced in the average hour of work—has increased 109 percent since 1968; net productivity (gross productivity net of depreciation) has increased 93 percent. 3. See, for example, Card and Krueger (1995), Doucouliagous and Stanley (2009), Schmitt (2013b), and Belman and Wolfson (2014). For a different read of the evidence, see Neumark and Wascher (2008). 4. Council of Economic Advisers (2010), Table B-42. 5. Unless otherwise stated, our estimate of the median wage is for full-time, full-year workers, age 16 or older, who are not self-employed in unincorporated businesses, as reported in the March Current Population Survey (CPS). See the technical appendix for further details. 6. See Kaitz (1970), cited in Card and Krueger (1995). 7. For the complete text of the bill, see https://www.congress.gov/bill/113th-congress/senate-bill/460/text. 8. Here and elsewhere, we use the Congressional Budget Office’s (2015) projections for the CPI-U when making our own projections for 2020. 9. The full increase would be phased in, with an increase of $0.75 followed by four annual increases of $1.00 each. 10. One reason for preferring the median to the average production worker wage as a benchmark for future minimum-wage increases is that the median is unlikely to be affected by the minimum wage (Autor, Manning, and Smith 2010), while the minimum wage mechanically has a direct, if likely small, impact on the average production worker wage. 11. We use net productivity (output of goods and services less depreciation per hour worked) in the total economy. The standard gross productivity figure includes depreciation—production used to make up for capital goods that have outlived their useful life—which is generally not available to increase consumption by workers. 12. For these calculations, we deflate the minimum wage by the CPI-U-RS and net productivity by the GDP deflator. Using the CPI-U-RS or the GDP deflator to deflate both wages and output shows similar trends for 1968–2014 and in our simulations through 2020. 13. Between the end of World War II and the early 1970s, the minimum wage kept pace with average productivity growth in the U.S. economy. See Schmitt (2013b). 14. The CBO (2014, Table 1) estimated that the “likely range” of employment changes following an increase in the federal minimum wage to $10.10 per hour would run from a “[v]ery slight decrease to -1.0 million workers,” while about 16.5 million workers would have directly higher earnings. 15. As noted earlier, our simulations assume no impact of the phase-in of the minimum wage in 2016–2020 on the median hourly wage or on the average hourly earnings of production and nonsupervisory workers in 2020. The phase-in is unlikely to have an impact on the median wage (Autor, Manning, and Smith 2010), which will lie substantially above the minimum wage in 2020. The phase-in, however, will have a mechanical impact on the calculation of the average hourly earnings of production and nonsupervisory workers, since minimum-wage workers are part of this group. To the extent that the increase in the minimum wage in 2016–2020 raises the average production worker wage in 2020 above our projection, the ratio of the minimum wage to the average production worker wage in 2020 would be lower than what we project in Table 1. 16. We also note that the OECD and our series, both based on the March CPS, track each other closely. Several features of the March CPS make using the survey to estimate an hourly wage in the 1960s challenging. Despite likely methodological differences with the OECD, our series and theirs produce broadly similar results, with the OECD showing the 1968 minimum wage higher relative to the median than our series. See the appendix for further detail. 17. See Mishel et al. (2012). The gap between average productivity and compensation across the majority of the wage distribution holds even using net productivity (which we use in the calculations in Table 1 and elsewhere), a common deflator for wages and output, and other adjustments. See also Baker (2007). 18. Mishel (2014). See also, Schmitt and Jones (2012), for a similar analysis using 1979 as a base. 19. This excludes the outlier of Washington, D.C., which is also excluded from Figure C.
20. We exclude the District of Columbia, which is an even greater high-wage outlier than Connecticut. With this exclusion, the standard deviation in 1968 was 11.2, falling to 10.7 in 2013; including the District of Columbia, the standard deviation rose from 11.0 to 12.3. 21. As before, we assume no real wage growth and no change in the wage distribution between 2014 and 2020. 22. 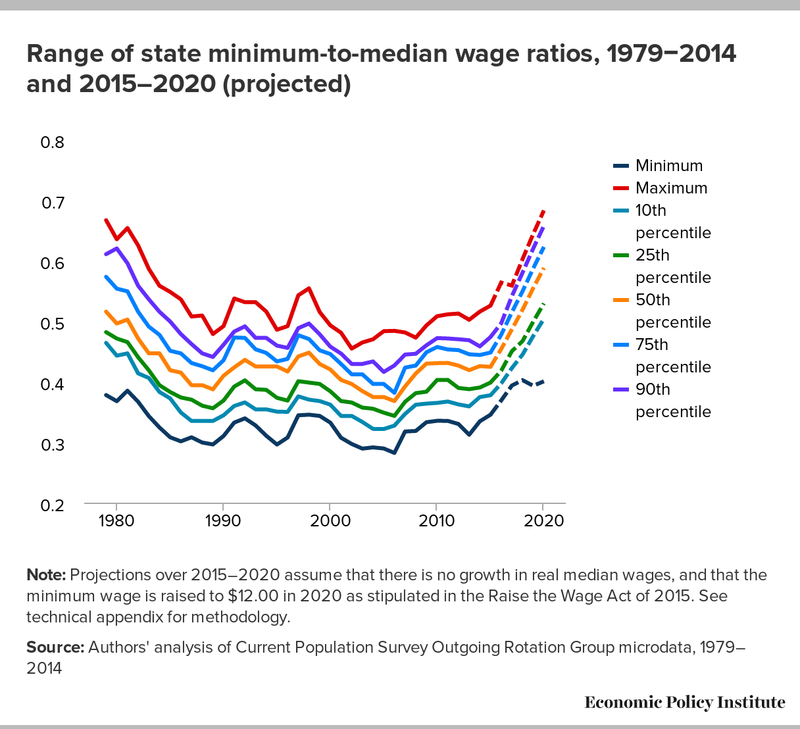 Under our standard assumptions, the standard deviation of the ratio of the federal minimum wage to the state-group median wage in 2020 would be 5.3, compared with 6.4 in 1968. 23. 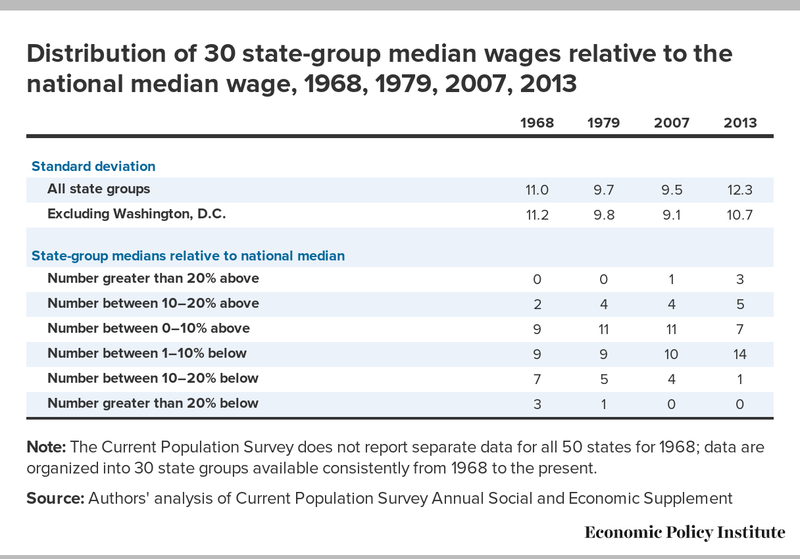 The convergence of state median wages does not imply that overall wage inequality has decreased since 1968. In fact, overall wage inequality has increased substantially over the period due to much greater wage inequality within each state—in part reflecting the decline in the absolute and relative value of the minimum wage. 24. We thank Ben Zipperer for providing these data. Here we switch from the March CPS to the CPS ORG, in part to check our analysis by using the entirely different hourly wage concept in the CPS ORG. The CPS ORG data are not available before 1979. In order to get a clearer picture of state-specific minimum wages, we also analyze the data for all 50 states and the District of Columbia, rather than the 30 state groups we have generally used so far. Belman, Dale, and Paul Wolfson. 2014. What Does the Minimum Wage Do? Upjohn Institute for Employment Research. Doucouliagos, Hristos, and T. D. Stanley. 2009. “Publication Selection Bias in Minimum-Wage Research? A Meta-Regression Analysis.” British Journal of Industrial Relations, vol. 47, no. 2, 406–428. Kaitz, Hyman. 1970. “Experience of the Past: The National Minimum,” in Youth Unemployment and Minimum Wages, U.S. Department of Labor, Bureau of Labor Statistics, Bulletin 1657:30-54, Washington, DC: U.S. Government Printing Office. Neumark, David, and William Wascher. 2008. Minimum Wages. Cambridge, MA: The MIT Press.